There will be a Gallery Reception on Thursday, March 11, 2004 at 4:00 p.m., Kristin Wigley-Fleming Fine Arts Gallery, Center for the Arts. All are welcome. Andrew MacGuffie holds a BA from St. Olaf College, Northfield, MN, and an MFA from the University of Minnesota, Minneapolis. In 1998 he received a H.D. Smith Purchase Award from the University of Minnesota, and in 2001 he was the recipient of an ECAC/McKnight fellowship. MacGuffie's work has appeared in several exhibits, including the Second Annual McLauffman Vessel Show in Osceola, WI, and The Foot in the Door Show at the Minneapolis Institute of Art. He has been invited to submit pieces for several sculpture parks, among them the Franconia Sculpture Park, Shafer, MN, and New York Mills Sculpture, New York Mills, MN. His work has also shown at the Katherine E. Nash Gallery, Minneapolis; the Northfield (MN) Arts Guild; and the Rochester (MN) Arts Center. 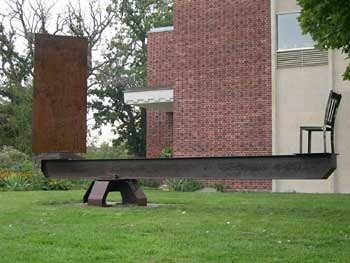 "A Chair for Copernicus" was on exhibit in St. Louis, MO, before coming to Luther College. The sculpture makes reference to Polish astronomer Nicolaus Copernicus (1473-1543), who established that the earth orbits around the sun. 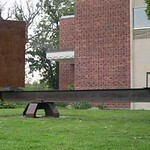 Andrew MacGuffie will be working in residence at Luther College during January, 2004. He will create an installation for the Kristin Wigley-Fleming Gallery that will be in view Feb. 4 - March 11, 2004. MacGuffie will be working in the sculpture studio in Storre, and visitors are welcome to stop in and see the work develop.